I know I owe you guys some answers to your questions from yesterday... but I had to hold that up for this exciting post! The folks over at CSN Stores has asked me to do a giveaway with their products. CSN Stores has over 200 websites featuring everything from cookware to clothes - including a website that exclusively sells bar stools! Le Creuset's Square Dish is truly an all-in-one dish that you can use for baking, slicing, serving, and storage. Poterie Stoneware can be used in the oven, broiler, or microwave and will not absorb odors or flavors. The durable finish resists chipping, scratching and staining. This beautiful and colorful piece has sure grip handles to go straight from baking to tabletop, making an impressive presentation. * Dishwasher, microwave, freezer safe and oven safe to 500°F for convenience and versatility. * The glazed interior is nonporous so foods won't interact. 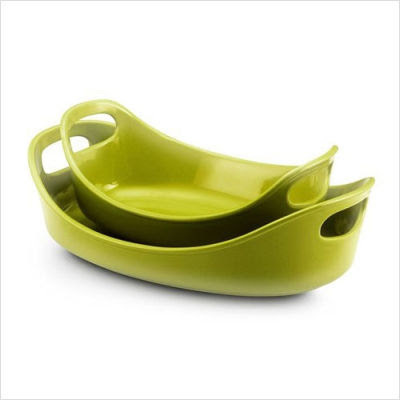 * Contemporary, playful shape in a vibrant and fun color goes directly from oven to table. * The shallow sides result in crunchy tops for each serving. * All bakers conveniently nest together to save space in your cupboard. * Extra wide handle holes allow you to remove the stoneware from the oven. Finally a convenient way to make delicious homemade ice cream! 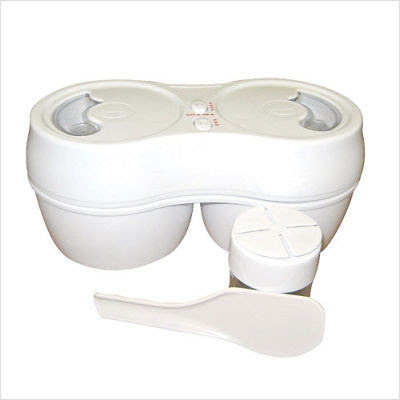 The FT03G - Deluxe Double Tream Ice Cream Maker lets you make two different recipes at the same time. Just add your favorite ingredients and place into your freezer. A thermal sensor will activate the unit to mix the ingredients for you automatically and your ice cream will be ready to enjoy in 70-90 minutes. *** All entries must be recieved by midnight (CST) on March 24th. 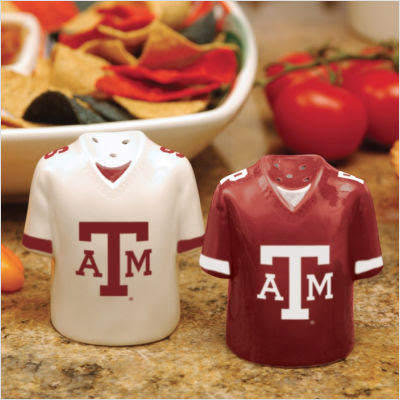 I would love to win the salt and pepper shakers in Penn State! The hubs and his brother are big fans! His bro went to school there and I think those are sooo cute and Awesome!! you picked out some nice prizes, lovey! i would like the Le Creuset 9" Square Baking Dish with Bonus 5" Baking Dish in Caribbean if i win. I didn't know I needed those Rachel Ray Bubble and Brown stoneware until you posted it....they are so neat and funky and I love the color!!! I would pick the 1st prize (the bake ware dishes). LOVE THEM! I'd like the blue stoneware. The color is awesome! I'd love the Le Creuset baking dish.. #1, Le Creuset makes me drool a bit, and #2 I absolutely LOVE the color!!! You picked out some great prizes! I should read more thoroughly... This comment will be that I'm already a follower! wahoo! I have been wanting a Bubble & Brown Set for a long time now. I cook all the time for my family and for friends. It's a very nice way to present the food. I am a follower have been for a while now. I usually don't do give away stuff but I want a set really bad. Pick Me - I like my table to look nice. I made homemade ice cream for the first time last year. I borrow the ice cream maker from a friend. IF I have my own I could do it so much more often. So Please consider me for the Ice Cream Maker. I enjoy your post and follow you with Bloglines. I don't have a blog, I love reading through others! :) and I am still a follower ! I don't have a blog anymore, and I'm already a follower...so I guess I only get one entry :( I'd pick the Le Creuset dishes if I won! I would pick the ice cream maker because my parent had one they let me borrow and I broke it accidently! Oops!!! :) It'd be nice to give them a new one that they could enjoy this summer with their grandkids! How much fun!! You make this fun and exciting!! Well, known you since college, I am pretty sure I am a fan or follower or something. Your blog is about the only one I keep up with. I would love the Le Creuset baking dishes. I could bake up some tasty and beautiful gluten-free yummy's in those. Have fun with this, and I hope I win!! i would love the le creuset baking dishes! le creuset is an excellent brand of cookware. How neat! I can't believe they are asking you give away their stuff! I love the Rachael Ray “Bubble & Brown” 2-Piece Stoneware Baker Set! I can't post about it tonight but I will before its over with! I would choose the 'Le Creuset 9" Square Baking Dish with Bonus 5" Baking Dish in Caribbean'! I need some new cookware and that would be perfect! I would love the Le Creuset baking dish, what an awesome color! I want the icecream maker! My husband and I LOOVE icecream and we didn't get the one we registered for. Pick us! The Le Creuset because I blue, beautiful, and I love to bake! I am a follower now! Bubble and Brown set because the color is fabulous! I can't resist that beautiful turquoise color! So pretty! and it's in teal. HELLO! entry 2: i am a follower. Sorry it's such a crapola post. You know, this work version of my blogging platform is for the birdies! this is on my sidebar! I would like the Rachael Ray “Bubble & Brown” 2-Piece Stoneware Baker Set in Green because I do a lot of baking and rachel ray rocks! I love them all! So hard to choose but I love the Le Creuset, it's in my fav color! I would love to have the Le Creuset because I have wanted them since the first time I saw them. 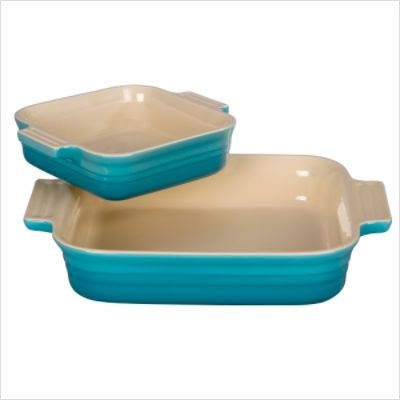 I would love the carribean blue bakeware (the 1st choice) b/c my kitchen is in blue! I would pick the Rachel Ray Bubble and Brown 2 pc set! I love the look and the color. Thanks! Also, I would LOVE the Le Creuset dishes. The color is just lovely. I LOVE the Le Creuset 9" Square Baking Dish with Bonus 5" Baking Dish in Caribbean...But I do also love everything else!! The Le Creuset please!! Love it!! Great giveaway! I am a new follower! hooray! I would love to have the Le Creuset set... I absolutely love the color -- and, Le Creuset makes great quality bake ware. I like the Le Creuset's baking dishes because the color is very attractive and I need some new casserole dishes. I would pick the Le Creuset 9" Square Baking Dish with Bonus 5" Baking Dish in Caribbean. I love that blue color and could always use more baking dishes. I am a new follower. I found you through my friend Danielle. I would love to win the Le Creuset 9" Square Baking Dish with Bonus 5" Baking Dish in Caribbean if i win. I am going to put in my sidebar right now. Just found your blog. May God bless you on your journey :) You seem like a very strong woman and I think that's so wonderful. What a fun giveaway! I love the Rachel Ray set because I love Rachel Ray! Le Creuset 9" Square Baking Dish with Bonus 5" Baking Dish in Caribbean not only because of its gorgeous color, but also because my daughter is getting married in 2 months and these would be prefect for her. Le Creuset 9" Square Baking Dish with Bonus 5" Baking Dish in Caribbean. Le Creuset, please! I've wanted some of their wares for a long time. Thanks for the giveaway! I'd choose the Le Creuset baking dishes - they're great sizes and I love the color, too. I would definitely go with the ice cream maker! My husband is lactose intollerant and I've been dying to try a soy ice cream recipe for him (or ice cream made with coconut milk or almond milk!) His birthday is coming up soon, so the ice cream maker would be perfect for me to make him ice cream for his birthday! I love the turquoise Crueset. It's beautiful.